Is the Internet Getting Faster? How Fast Is Your High-Speed Internet? Americans enjoyed a 360% increase in Internet download speeds between March, 2011, and September, 2014, according to the FCC’s 2015 “Measuring Broadband America: Fixed Broadband Report.” (“Fixed” broadband included cable, DSL, satellite, and fiber optic connections.) The latest measurements, in September, 2014, showed an average download speed for all ISPs of 32 Mbps; in 2011, it was only 9 Mbps. But wait! The only other broad measure of U. S. Internet speeds, Akamai Technology’s “State of the Internet” report, shows an increase of only 290% over the same time period. Yet Akamai reports an average overall U. S. download speed of 48.8 Mbps in Q3 2014, more than 16 Mbps faster than the FCC’s figure. What’s going on here? The differences arise from different ways of measuring different populations. The FCC uses SamKnows, a measurement system developed by the FCC’s counterpart in the UK, OfCom. It involves putting boxes in selected consumers’ homes that measure the actual speed of Internet traffic where it really matters to the average American family. Akamai’s figures are based upon the speed of connections to Akamai’s global network of content-caching servers. Households, businesses, universities, government offices, and military units are included in Akamai’s measurements; many of those entities have Internet connections that are much faster than the typical household’s. So for you and me, the FCC’s figures are probably more relevant. Still, the FCC and Akamai agree that broadband average speeds have increased by about three times during the three-and-a-half years measured. Most home Internet subscribers got actual download speeds that were pretty close to the speeds advertised by broadband ISPs, the FCC found. 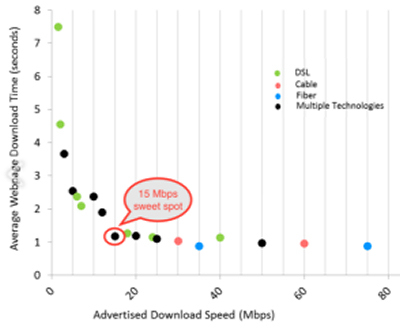 More than 90% of subscribers to Comcast, Cablevision, and Hughes Networks got average download speeds of at least 95% of the advertised speeds. Cablevision, Comcast and Verizon FiOS performed well under stress, delivering advertised speeds or faster to 80% of their subscribers during 80% of more of peak usage hours. 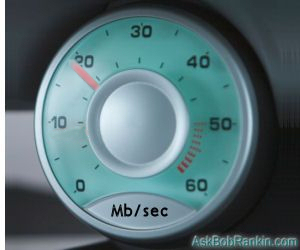 There are quite a few definitions of internet speed and several free ways to test it. Get the scoop on Internet speed tests, and why you definitely should check your speed every once in a while. See HOWTO: Measure Your Internet Speed. Cablevision subscribers saw the fastest average speed (60 Mbps), followed by Verizon and Charter at 50 Mbps, Cox at 40 Mbps, and Comcast at 35 Mbps. DSL average speeds remained stuck at about 12 Mbps. As I warned in, “Are Landlines Doomed To Extinction?” the century-old copper wire network upon which DSL and plain old telephones depend is on its way out. Don’t expect significant upgrades there. The good news (sort of) for DSL subscribers is that they may not need faster connections, if all they do is surf the Web. The FCC found that the average speed at which Web pages download maxes out at about 15 Mbps no matter how fast a household’s connection is. (See chart below) This limit is due mainly to Web servers that can’t keep up with demand; consumers and ISPs can’t do much about it. My own experience indicates this is correct. After upgrading my Verizon FiOS connection from 25 to 50 Mbps, I didn't notice any appreciable increase in web page loading time. It's like trying to drive a Ferrari in a traffic jam. The fastest States were New Jersey (57 Mbps) and Connecticut (47 Mbps). Idaho, Ohio and Arkansas were at the bottom with average speeds around 14 Mbps. I’m not sure how much faster we really need to get, given the FCC's findings on web speed mentioned above. If taxpayer dollars are to be used to improve the digital infrastructure, I think the U. S. should focus more on faster and more reliable Internet speeds in rural areas. There are still many areas where only temperamental satellite or (gasp!) super-slow dialup access is available. For those folks, things like Netflix, Skype and VoIP calling are out of reach. Your thoughts on these subjects, as well as your personal Internet experience, are welcome. How Fast is Satellite Internet Service? Do You Really Need an ISP? Is Satellite Internet a Good Choice? Should You Care About Net Neutrality? Does Your ISP Have a Data Cap? You Want Faster and Safer Internet? Hacking Airplanes: Fact or Fiction? Is the USA Giving Up Control of the Internet? Most recent comments on "Is the Internet Getting Faster?" Please accept my best wishes for a happy and successful New Year 2016. Oh, I agree with all that is mentioned, in this article! When I first started using the Internet, I was an AOL member and I can't tell you how many times, I was knocked off! I had a 14.4K modem, then a 28.8K and I thought I had died and went to heaven, when I got my 56K modem!!! Back in the late 90's, I read about DSL. I live in Metro Atlanta and it was being tested in Birmingham, AL. I was so excited and couldn't wait until I got DSL. In March 2000 I got my DSL component. It was a DSL card that was installed in my computer. It was NOT a router, that came later. I got 1.5 mpbs and thought I had the fastest download speed, on the planet. Now, I have a DSL Router, that I can get 25 Mbps download time. I get pretty close to that, depending on where I am connecting to. In Atlanta I get about 23 to 24 Mbps, but when I connect to Los Angeles or Seattle I only get about 10 to 13 Mbps. Speed is still controlled by the trunks across the USA. When the trunks are busy, everyone's speed goes down. Yes, the phone companies are improving the infrastructure, but it still takes a lot of time, to upgrade to fiber-optic. Fiber-optic has it's own problems, when the fibers in the bundle start to break and they can, your speed will go down, as well. I worked with fiber-optic endoscopes and those fibers are very delicate. For the scopes, you started to see black spots, meaning a dead fiber. It would be no different than "dead" fibers in the fiber-optic bundle for high speed Internet. The other fibers would have to work harder and eventually, they would die as well. Internet fiber-optic bundles are huge, but, the basics are still the same, once a dead fiber, more will come. It similar to bad sectors on a Hard Drive. Once they crop up, the Hard Drive will eventually die. It's ironic that we've pushed to get a faster Internet, and then Web pages have added videos, ads, pop-ups, and other stuff, which make the pages seem to load about as quickly (slowly?) as when we had dial-up. I agree with you about our tax money. We need to be increasing the rural access to high speed internet. We, as a country, need to find a way to make broadband more affordable for both rural and the poor in our urban areas. Otherwise, other countries will continue to surpass us in this area, and that will not bode well 20 years from now. My peeve is the mysterious pause with the stalled "busy" circle, either circling or frozen, that I often experience when surfing the web. I wonder what is causing this. When I test the internet connection speed, I invariably see that I have the speed I am paying Cablevision for (25 Mbps). Anyone have ideas? Bob, I enjoyed this article very much. I remember when I worked for at&t & setting up spare circuits around the world for our "Christmas Net". It was a network of Teletype model 28 that we used to send Christmas pictures using paper tape. Some of those pictures took hours and the paper tape spools measured 10 inches in diameter on the big pictures. We had to limit the speed to 50 baud due to speed of print on those 5-level machines. I have been following your emails since Tours days. Keep up the good work! You raise some interesting facts, most of which are worth considering. Yes, infrastructure download/upload speed doesn't make a lot of difference when most web servers won't serve content faster than 15 Mbps. Since the World Wide Web began, I've found that download times for web pages hasn't changed much. The size of web pages content has more than kept pace with download speed improvements, so webpages take about the same time to download. For video streaming or big datasets, speed counts. What is really awful is the lack of competition among ISP services in much of the USA. I live in a metro area in NJ, with effectively just one provider (Comcast), who charges monopolistic prices. The US could do a lot better in providing effective download speeds but first we'll have to bust the monopolies. Real competition is a great thing. Nice article, but like and earlier poster I live in the boonies with Century Link DSL that is nominally 1.5Mbps and there are times when I get that or close to it, but I also get periods of time when it steadily drops to virtually zero every single day, usually after 7:30 pm. I can still watch Netflix at 0.5Mbps, but any lower and I have to wait for buffering. Below 0.3Mbps (and yes it does go below that daily) and I have to go back to Dishnet TV. Since I do watch Netflix and Amazon Prime wireless telephone or satellite internet is pretty much out of the question. Very interesting article. About copper phone lines on the way out, at the current electronics convention, there is a company with equipment that will transmit 750 Mbs on copper phone wire. I live in a town of 200000 people which is on the edge of one of Americas largest metropolitan areas. Internet access, here, is pretty good for most folks, but the area that I live in has NO CABLE (we also have only one televison channel that we can receive because of a mountain between us and the TV transmitters 50 miles away- a PBS station), and our telephone copper wires limit us to 768 Kbps mas DSL. So in our small area of this very large town, the approximate 500 residents have contracted out to a private company to get us internet access. They have done it using 3 radio transmitters within the community, transmitting to antennas on our roofs and then sent to a modem in our homes. They claim we get 3 Mbps. Of course, that is not the case as we actually share the radio transmissions, so average throughput is much less. Previously, I lived in an area served by Charter Communications. I used to get their internet at about 40 Mbps and was very happy. I am not with the radio transmitted internet. The only other alternative is Satellite internet which is not only pricey, it limits bandwidth. I use 30 - 50 GB bandwidth a month which is way over their limit. Satellite is not an option. We do use Satellite Television, as that is our only option. Bob: Yes it is amazing the speed increase. At home with Charter we get 60+ Mbps. However at work, out in the boonies, we get 3 Mbps with a dish. We work within proximity of a National Lab with 2 super computers. The fiber line runs in front of our building, just need to figure out how to tap into it, quietly. Verizon used to advertise 12mbps download DSL in this SE Pa. 2 years ago. Now hi-speed is 3mbps at max. Upload speed is .6mbps. So Faster? Re: The "stalled" circle animation used to indicate "server busy" condition. I recently switched to a fiber connection and experienced the same condition before and after the fiber switchover. The installing company first told me my modem was too old and may be dropping out randomly, selling me the fiber upgrade and a new modem in the process. When the problem persisted, a tech was assigned and actually found a problem. Modem drops. Investigation showed that the modem dropped 130 times in a thirty day period. Since the length of the drops varied, some auto resetting took place and sometimes it did not reset. The "circle" stops during these drops, and restarts if the drop resets successfully. My cause was caused by rotting and damaged copper wiring from my computer to the point to where the copper connected to the fiber, which is about a quarter mile away. I live in an older neighborhood and some of the wiring is approaching 100 years. I now have a connection which was hand picked by the tech using diagnostic equipment, but still retaining it's age until new copper can be run or replaced by fiber. You guys live in Heaven I reckon, here in Australia, best I can get is around 6mbps. This is with Adsl2+ although fibre optic is coming, I am not holding my breath. All the Govt is doing is arguing about it, with not a lot happening. Some areas have it, but in my place only 17km from the CBD of Adelaide, it is not even shown in the planning stages. Just this summer got connected to fiber optic services from a dial up I had struggled with for many years. What a fantastic improvement---also now have VoIP. My internet use has now become a whole new world for me. This will give the connecting hops and how long it takes to reach one. What you would look for are those showing "Request timed out." Those are bottleneck relays. 2) The site's servers may be slow. This could be due to high traffic or just outdated servers. Of course, there are other factors; such as poor page design, bad links to graphics or ads, or even hardware connection problems. As Bob pointed out, the site's servers are the biggest problem. New servers have no visible ROI, so they are not a high priority. No matter how fast the CPU, bus speed, cache/RAM, or Internet connection, all computers wait at the same speed. Agree with the rural areas for sure. Windstream is my only choice in my area and Google is full of things about their service so I'll just leave it there. There should be a Rural Internet Service Act implemented just as in the past we had the Rural Electrification Act. The same complaints from the internet service suppliers as the electric companies gave. We don't have the money to supply electricity to the rural area. As someone else mentioned, with some areas having faster service the web sites add more videos and long scripts that they can handle. Just adds to the frustration for us with slower service. My joke is the kids in school that have homework to do can get theirs done while the Windstream kids are still just watching the little circle rotate. Forget about 4k TV's and other home management electronics with the slow service.